I am never going to be stumped for something to serve a Vegan dinner guest for desert again!! 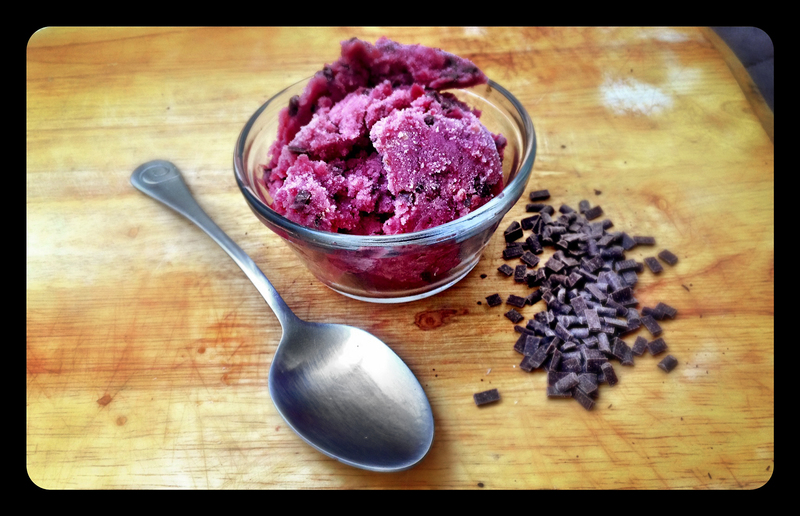 This quick recipe, from Treehugger, makes a rich a creamy “ice cream” like desert that is completely Vegan and uses no dairy substitutes. How does this work? The answer is . . . BANANAS!!! It is great to have another recipe that uses those bananas that are just starting to go too brown and are not so nice for eating anymore. Honestly, there is only so much banana bread a girl can eat, or give away to friends. To make this recipe all you need is bananas, a blender, and about 5 minutes of time. The secret is popping the bananas in the freezer beforehand. Unlike other fruit there is more sugar in bananas than water, so when you freeze them and then put them in a blender they do not break apart and go slushy. Instead, they stick together and turn into a rich creamy mixture not all that dissimilar from ice cream. Once you have the base mixture of blended banana, you can pretty much add any ingredients you want to make your personal ice cream flavor. All sorts of frozen fruit combinations would work here or you can use fresh fruit, but then have to pop in back in the freezer for a bit before eating. Also, nuts or chocolate never go amiss in ice cream. I chose cherry and dark chocolate, but hey . . . get crazy . . . experiment a little . . . and have fun. Make sure you peel and chop up the banana into pieces before you put it in the freezer. I did not originally do this, and could not peel my frozen bananas. Place the frozen banana pieces and your chosen fruits into your blender and pulse. This will help break up the larger chunk of frozen banana to make it easier for your blender to process. Once you have pulsed a few times, blend the banana and fruit into a creamy puree, add more juice for extra flavor. Mix in any toppings like chocolate chips or chopped nuts. Your mixture should be the consistency of ice cream, and can be eaten right away. If it is too liquid from juice or melting, pop it back into the freezer for a few minutes to harden up. Antipasto means “before the meal” and is the first course of a formal Italian dinner. Now, I know traditional antipasti plates have cured meats on them as well, but personally I say “who needs it” when you have all sorts of yummy pickled and marinated vegetables with different kinds of cheeses thrown in for good measure. The contents of a traditional Italian antipasto vary greatly according to regional cuisine, and this salad is something you can easily vary according to your own tastes.. This Antipasto Salad is something I threw together to go with an Italian dinner I was making years ago, and have continued making it ever since. I do not think I have ever made it exactly the same way twice; there is plenty of room for your own experimentation, but the basic idea is always the same. In this version I used a combination of spinach, rocket (arugula), and fresh basil leaves as the greens, with artichokes, sun dried tomatoes, capers, peppadew peppers, and pan fried haloumi on top, but marinated mushrooms, cocktail onions, olives, roasted red peppers, pepperoncinis, marinated garlic, fresh mozzerella, parmesan, feta or numerous other marinated or pickled vegetables and fresh cheeses are all other options. None of the measurements below are exact, it all depends how much of the different ingredients you want to add to your salad. This salad can be made vegan, by leaving off the cheese and it still has plenty of flavor. Mix your greens together in a large bowl. 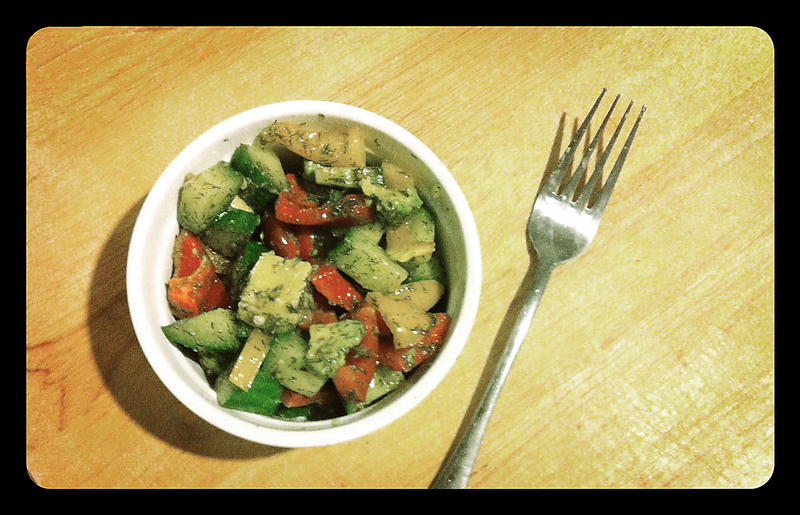 Roughly chop your marinated and pickled vegetables, and add them into the bowl along with the capers. Add your cheese and dressing on top of the salad. 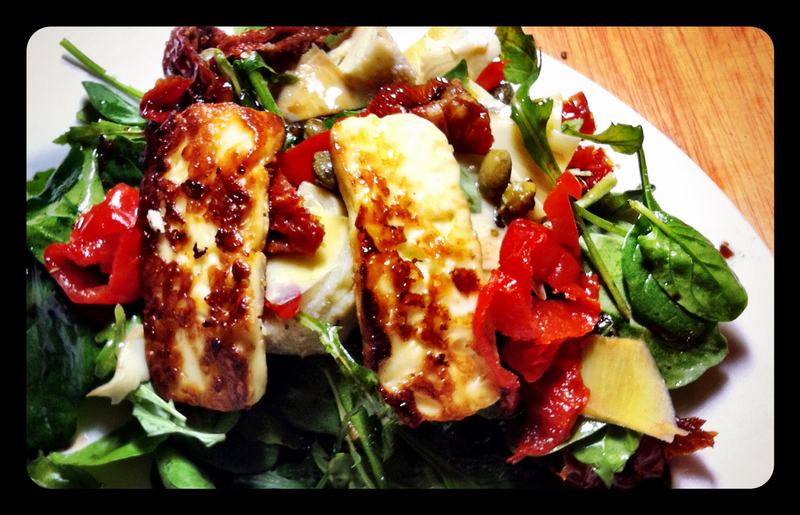 If using haloumi: On a medium high temperature, heat enough olive oil to cover the bottom of the pan. Cut the haloumi into 5mm or 1/8 inch slices and add them to the pan, once the oil has been heated. Let the cheese brown on each side for about 2-3 minutes. If your haloumi looks like it is starting to melt, you probably have your heat too high.Let the cheese cool slightly but add to the salad and serve still warm. For the dressing: Mix all the ingredients in a small bowl with a whisk or fork until they looked combined. On to Day 26, Herbivores . . .
Today was a busy day, did not have time to grab breakfast, and got home late. These kind of days are where quick snacks come in handy, and quick recipes. I had seen this recipe for easy No Bake Granola Bars on Food52, and figured I would keep it around for one of these short on time days during the 100 Days Project. All these ingredients are items I normally keep in my pantry, and I think most people will probably have around. I used rolled oats, sunflower seeds, pumpkin seeds, raisins, and dried cranberries, but there are infinite various on this combination. You can easily tailor the recipe to suit your personal tastes. 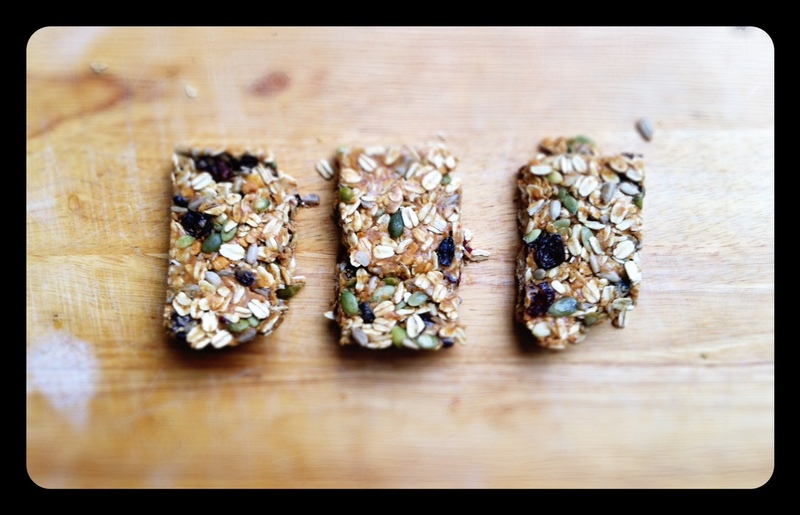 Some other suggestions might be chocolate chips, dried pineapple, cashews, almonds, coconut, or dried cherries, and these granola bars could easily be made gluten free by using puffed millet and other gluten free cereals instead of oats. This recipe can also be made Vegan by substituting the honey with agave nectar or brown rice syrup. Personally I love honey though, I think honey is one of the main reasons I am not Vegan. Well . . . honey and cheese. I a small bowl, whisk together nut butter, sweetener, and sea salt. I used a half and half combination of Pics Peanut butter and Almond butter, mostly because I did not have enough peanut butter on its own, but also because I thought it would give an interesting taste. If you are in New Zealand, where it is easier to find solid honey than liquid honey, put the solid honey in the microwave for 30 seconds to loosen it up before trying to whisk it into the peanut butter. Pour into oat mixture, and mix well, till everything is sticky and combined. If it’s too dry, add a bit more honey. Press mixture into a shallow baking dish that you’ve lined with foil, saran wrap, or baking paper. Cover with more foil/saran, press well into the baking dish (Iused the bottom on another baking dish for this in order to make sure the pressure was flat and even), and refrigerate for 4 hours. Cut into bar shapes, wrap, and keep refridgerated till ready to use. They will last two weeks in the fridge. This side salad is perfect for when you need something fresh and lite to go with you main meal. I made it to go with the Creamy Leek and Brussels Sprout Soup in my Day 4 post, and the the crisp sweetness of the raw vegetables and fragrant dill nicely balance the creaminess and subtle spice of the soup. I used cucumber, red capsicum, yellow capsicum, and avocado, but realistically that was just because those were the vegetables in my fridge. You can use any combination of vegetables you feel will go well together. Besides anything topped with this Dill Dressing will taste brilliant. This does not take long at all to throw together, and can vary infinitely. You can also substitute other fresh herbs for the dill to make different types of dressing. Place all the salad ingredients in a large bowl and set aside. In a small bowl, whisk together the vinegar and salt until the salt dissolves. Add dill, mustard and shallot and whisk to combine. Slowly drizzle in olive oil, whisking constantly, until dressing is smooth and emulsified. You can also use an immersion/stick blender to emulsify the dressing, which will take less time. Place all ingredients into the tall plastic cup that comes with most immersion/stick blenders, and whizz until dressing takes on a creamy white look. Pour dressing over salad and toss until all ingredients are evenly coated. Salad will keep, dressed and refrigerated, for up to 6 hours. For longer storage, keep chopped and assembled salad ingredients covered in the refrigerator up to 1 day ahead and toss with dressing just before serving.